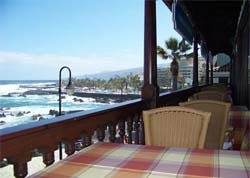 The Rancho Grande is a Spanish restaurant located in the middle of the Northern coast of the Spanish island of Tenerife. However the Rancho Grande is much more than just a restaurant as it incorporates a bakery, a patisserie and a cafe into the same building. The Rancho Grande is therefore a great place to experience all that Spanish food has to offer. The Rancho Grande is owned by Mr and Mrs Meul who bought the building back in the year of 1976. Originally the building that now houses the restaurant was the Hotel Royal, a hotel just north of the San Telmo beach. The couple then converted the old hotel into the restaurant you can visit today. The restaurant is designed in a traditional Canarian style which is meant to make the customers feel more at home. The Rancho Grande is therefore decorated in a rustic style with traditional furniture and decorations. The most impressive piece in the restaurant is the coloured glass roof which is opened fully when the weather is hot, creating the impression of sitting on a terrace. Upstairs there is a real terrace which is used as the main cafe area. >From wherever you are, the view from the Rancho Grande is second to none as it overlooks the San Telmo beach and the Atlantic Ocean. The restaurant likes to be a part of the local culture in Tenerife and therefore plays an active part in the famous Tenerife Carnival. Furthermore, it is the place where the German Carnival Society from Düsseldorf meets every year before they begin their celebrations. The Rancho Grande prides itself on its traditional Spanish and Canarian dishes. In addition to the Spanish food on offer, the menu also includes a selection of food from Germany including fish and steak dishes. You can be assured of the quality of the meat that is being cooked at the Rancho Grande as the team select the produce they use very carefully. Some of the meat used is flown all the way from Latin America, an area that is famous for its fine meats, and is served with appropriate sauces and seasoning. Other imported produced at this Spanish restaurant in Tenerife include the coffee which comes from Germany. Although you can still get a great Spanish espresso too! 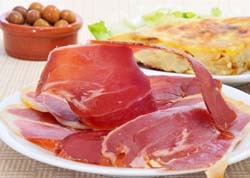 Local products are also used extensively in the restaurant's menu including the jamón serrano, olives and cheeses - definitely some of the things you must try when you visit Spain. Some of the local specialities that you can try at the Rancho Grande include the 'Carne con papas' (Meat with potatoes) which is a mix of diced meat served with bolied potatoes in a Canarian sauce, and the 'Conejo en Salmorejo' (Rabbit in Salmorejo) which is another Canarian dish made with rabbit, Salmorejo sauce and served with potatoes. Another dish to look out for is in the pudding menu. The banana split and the banana flambé may not appear to be traditional dishes from Tenerife but at the Rancho Grande they are made with bananas grown in the restaurant's plantation only a few miles away. On the upper floors of the building, you can find the restaurant's own bakery and patisserie which bakes traditional home-made bread, cakes and pastries which are then either sold to the public or used in the restaurant. Many of the pastries made are from German style recipes but you can also try some of the restaurants own creations too. Why not visit the Rancho Grande and try one of the cakes and perhaps study Spanish cake names too! The patisserie also offers its services to weddings and other celebrations, often decorated with photos printed onto edible paper. The pastry shop also produces special treats for those suffering from diabetes, meaning that everyone can enjoy a bit of sweetness!